Summary: Narrator Don Tillman 39, Melbourne genetics prof and Gregory Peck lookalike, sets a 16-page questionnaire The Wife Project to find a non-smoker, non-drinker ideal match. But Rosie and her Father Project supersede. The spontaneous always-late smoker-drinker wants to find her biological father. She resets his clock, throws off his schedule, and turns his life topsy-turvy. 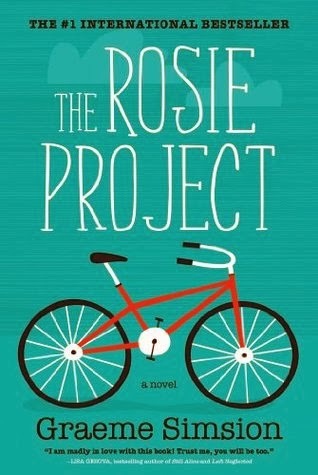 Review: The Rosie Project is one of those books where I finished and found myself immediately thinking that I could see it being made into a movie and wanted it to happen. Don Tillman is forty years old, single, and never expects to have romance in his life or get married. His life is very exact, and he prefers it that way - it makes sense, and logic dominates over anything else. Then he meets Rosie and all of that goes out the window. The Rosie Project is by turns embarrassing (just a warning, if you have a keen sense of second hand embarrassment, it might be triggered in this book! ), heartwarming, sad, adorable and hilarious. I thought it was awesome. I know that some people will undoubtedly criticize the author because of the main character - they'll say that the book makes light of medical conditions, etc. Maybe I'd agree if I came out of this feeling as though the author is pointing and laughing, but on the contrary - I feel the book uses humour to illuminate, rather than criticize or embarrass. Don is clearly a character we are meant to care for and empathise with, and it is incredibly possible to learn through reading this book. Personally, I found the book amazing for the journey it lead me on, as we follow Don through his journey of self discovery. There are certain key sentences that are short and simple, but the amount of information packed into them, the emotional impact - it's incredible, and that really added to the book, for me. This applied to thoughts about him, and thoughts about others around him. It's not just Don's story, it's Rosie's story and it's the story of Gene, Don's best friend, and someone who the book also revolves around in it's own way. I really enjoyed the book - I ended it with a smile on my face. I'd definitely recommend it.